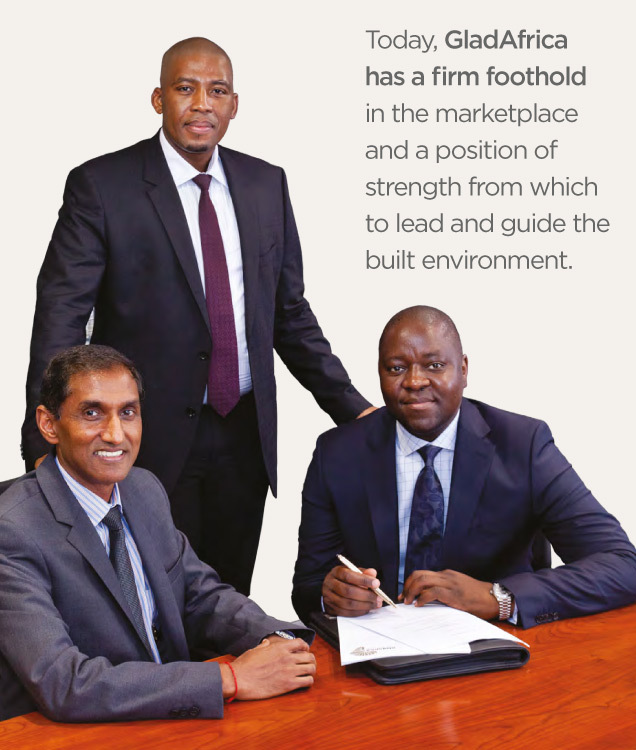 GladAfrica’s acquisition of a 100% shareholding in Ariya Project Managers (Pty) Ltd (Ariya) has strengthened the Group’s competitive edge in the building and construction industry locally and in the African region. The acquisition allows us to create a completely African-born organisation within the built environment, while realising our vision of creating life-changing, built-environment solutions. As a built-environment management consultancy active within a variety of markets, industries and sectors, Ariya has, since its establishment in 2005, created a solid track record among public and private sector clients alike and successfully completed a number of South Africa’s prestigious and high-profile infrastructure projects. The company is wholly black-owned with a 35% black women shareholding, level 2 B-BBEE and an international ISO 9001:2008 accreditation. Ariya has a firm footprint in the South African market and operates in Bloemfontein, Cape Town, Durban, Johannesburg, Port Elizabeth and Nelspruit. The acquisition enables GladAfrica to expand its project management footprint and add significant value to its comprehensive offering of customised project management services. The move also creates a uniquely African organisation with the expertise and capacity to meet market expectations in the built environment locally and in the African region. While GladAfrica will retain its Engineering Consulting arm, the Group will establish a new specialised company (GladAfrica Project Managers (Pty) Ltd) to focus primarily on project management services, including development management, tenant coordination and installation and procurement management. Ariya’s current Managing Director, Sigi Naidoo, will continue as Managing Director of the new entity. Given the solid track records of both companies in the industry and their similar work ethic and cultural fit, the new team is will offer the local and regional markets exciting alternative, value-added services. Ariya’s notable list of recent projects includes the MyCity BRT in Cape Town, Green Point Stadium and the University of Mpumalanga.